In July 9, while the world was expectant about the upcoming first manned landing on the moon, two little-known Central American States crossed sabers in what was derogatorily coined by the media as 'The Soccer War'. Far from a simple out-of-hand sports passion, this conflict had its complicated origins back in the early 20th century when the North American companies United Fruit and its rival, Standard Fruit, operated in Honduras - and both deemed it necessary to import workers from El Salvador, since the locals were insufficient in numbers. What followed was an exodus of more than 300,000 Salvadorans who settled in Honduras - and for a while, the latter country's government saw this with good eyes. That is until the early 1960s, when political changes and the liberalization of the region's commerce through the Common Market Treaty made it painfully evident that the country that benefited the most from it was El Salvador, while Honduras would be destined to carry a heavy economic burden. Inevitably, it chilled the relations between the two countries and had a direct bearing in the treatment from the Hondurans towards the Salvadoran peasants. Amidst sporadic violence against the immigrant peasants, the two governments began negotiations aimed at solving the immigration problem and signed three agreements. However, while the negotiations were taking place, clandestine armed groups were organized in Honduras with the purpose of harassing and controlling the Salvadoran people living in that country. This situation was worsened by a coup d'etat that brought to the presidency the Honduran General Oswaldo Lopez Arellano, who had a very different point of view than his predecessor regarding the immigrants' situation. Shortly after, the expelling of thousands of Salvadorans began. The return of the peasants to El Salvador brought a series of problems for that country, since all were returning unemployed and needing food, clothing and some kind of shelter - all of this in the midst of an economic crisis that not even the advantages obtained through the Common Market Treaty had been able to alleviate. Thus, it didn't take long for the Salvadoran society to begin clamoring for some sort of military response against Honduras. With this delicate political background, the eliminatory rounds for the Jules Rimet World Soccer Cup (to be held in Mexico the next year) began - and during these, the national teams of El Salvador and Honduras would have to face each other in order to obtain a classification. 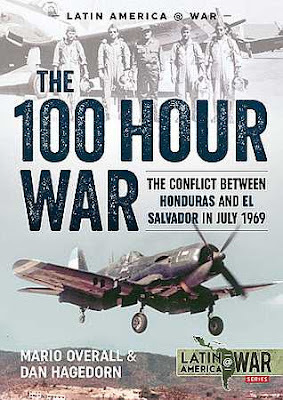 During those games, the violence against Salvadoran immigrants in Honduras increased and caused strong protests from the Salvadoran Government, which ended in the rupturing of diplomatic relations and followed by additional border incidents, which included the strafing of a Honduran airliner while it was taking off from Nueva Ocotepeque. Eleven days later, the war began. This book, backed by more than 20 years of research, explores meticulously the actions undertaken by both countries in the air and on the ground during this short but intense confrontation, and that saw the last dogfights between World War II-era piston-engine aircraft in the world. Besides an impressive selection of photos, the book also features a section of color profiles and markings, and a set of tables detailing the identities of the aircraft operated by both countries during the conflict.